Hyeuk Ju moved to Moscow when she was five, where she was able to experience different cultures and encounter various languages. Hyeuk Ju had to learn English, French, and Russian at a very young age, before she even mastered her mother tongue. When she came back to Korea, she found the classes were extremely difficult. However, with the help of teachers and friends, in time Hyeuk Ju became as comfortable with Korean as she was with English. This experience sparked an interest in interpretation and service. She realized that the help from her teachers and friends was invaluable in allowing her to adapt, first to Moscow and then again to Seoul. She wanted to be able to help others in the same way. Narasarang Campaign is a community service association that gives Korean students opportunities to do exactly that. Hyeuk Ju started working with Narasarang Campaign in her freshman year and discovered she deeply enjoyed the work. She volunteered at an event about North and South Korean unification, where she read out a short proclamation that she wrote in French regarding reunification. After that, Hyeuk Ju also worked to translate testimonies from North Korean refugees into English so that more people outside Korea could understand the severity of the current situation in North Korea. 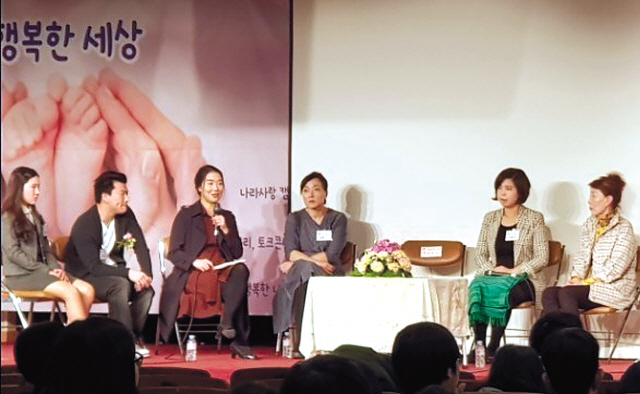 Hyeuk Ju’s most valuable work for the Narasarang Campaign, was when Mr. Shin was invited to talk about his story at their talk show last year. Mr. Shin was one of the many Korean children that got adopted overseas, who was fortunate enough to find his biological mother back in Korea. When Hyeuk Ju was told about the program, she knew Mr. Shin would have many of the same problems with language that she once did. She felt a strong connection, and volunteered to help him share his story by interpreting what he had to say to the non english speakers. At the talk show, Mr. Shin shared his story with the audience and answered their questions, while Hyeuk Ju translated the audience’s questions to him and his answers to them. This experience helped her to realize that a good interpreter can help you understand people that are different from you and help solve the issues around us. She continues to participate in programs which require familiarity with other languages. In fact, since the Narasarang talk show, Hyeuk Ju has guided foreigners at a history festival, and helped foreigners understand and participate in the exhibits at a Korean museum. One day, Hyeuk Ju wants to work for UNICEF, to directly help children in need. Currently, she is looking forward to participating in any programs that are related to helping others while navigating multiple cultures.